Garrison Brewing Company is currently celebrating 15 years in business. In early July I had a chance to have a Nit Wit and a “15th Anniversary HOPS, Mango and Ginger” with Garrison President Brian Titus to discuss the past, present and future of Garrison Brewing. Atlantic Canada Beer Blogger (ACBB): How did you decide to open Garrison Brewing Company? Brian Titus (BT): I had been into home brewing for 12 years prior to opening Garrison with the last 4 years getting into all grain brewing. It was a fun, “drinkable” hobby and one where I constantly wanted to learn more about using different yeasts, bulk extracts vs. kits, etc. While I always enjoyed trying imports there weren’t many options locally and most of the craft beers I’d tried over the years were as good if not better than the imports. I was stationed in Halifax with the Navy for a decade prior to opening and had been thinking about opening a brewery for a while. I saw that Sean Dunbar & Andy Hachey, two guys who decided not to be lawyers at the last minute, had opened up Picaroons in Frederiction and thought if it could work in Fredericton why not in Halifax? I spent some time with them in the Summer of 1996 and quit my job with the Navy shortly thereafter. ACBB: Tell me about the start of the company and how it has changed over the years. BT: The Brewery was incorporated in January of 1997 and had four false starts before finally opening the doors on Lady Hammond Road in the third week of August. Coincidentally, Propeller had just opened up as well but we saw this as a positive as it would help develop a community of craft beer drinkers quicker. We started initially with Irish Red Ale and Barrack Street Brown (now called Nut Brown Ale). We launched as draught only but were hand bottling and labeling within 3 months which was incredibly labour intensive. We started selling growlers within 2 years of opening but the concept was slow to take off at the time (much more popular now). We quickly hit 2000 HL annually and then hit a wall in terms of capacity. We simply had too much going on in a restricted space. Although knowing it wouldn’t be without its challenges, we would need to move the brewery to a larger location. At the time the port area was underdeveloped but had a vision for shops, the market, coffee roasters and a destination for cruise ships. In October, 2006 we started gutting our new location, a character space within the 1929 Immigration Annex building, and by Feb 2007 we were brewing there. We then had to re-think the retail end of the business; being so close to the cruise ships (about 140/year) we had to hire actual retail clerks & stock more than one style of T-shirt! We also re-branded to the current noon gun/red dot logo (our third since opening) and added new glassware, aprons, T’s, etc. Ultimately, you need local support to be successful year-round, but the cruise ship traffic has certainly helped. ACBB: Did you have any help from others in the industry to open? BT: Once I decided to make the move I wanted to learn about the industry and actually make sure I wanted to do it. I went out to Quidi Vidi Brewing in St. John’s, NF for a week to determine if this is how I wanted to spend the rest of my life. I spent time with all different elements of the operations – with the brewer, sales, bottling and was hands on with the work. I also spent some time with some different micros out West (Tree, Granville Island, Storm, etc.) to pick their brains including how to get product into a bar when up against Molson and Labatts? Today there is more of a sense of adventure when it comes to beer as consumers are more open minded and looking to try different things. The growth of micro-breweries has been great as it gets people away from the macros; as the saying goes the rising tide raises all ships. ACBB: What’s your proudest moment over the past 15 years? BT: Colin Allin is a former employee who did web and graphic design for us for 10 years. He was working remotely in Nicaragua, was shot and died one month later. We immediately wanted to do something to help out his family. Matt Phillips from Phillips Brewery, who is originally from Wolfville, agreed to help out with a collaboration brew with proceeds going to Colin’s family. Daniel Girard, our brewmaster, and Matt worked over email to get the right recipe for a Belgian IPA. Overall we raised $2300 for his family, setup a $1000 scholarship for NSCAD for 5 years & shot a great video. I look back and see this as a lasting positive coming out of something horrible. ACBB: What’s the biggest lesson you’ve learned in the past 15 years? BT: It would be on the personnel side, make sure you gather people who are very strong in what they do but fit the culture of the company. They need to work together to address problems. It’s important to have complimentary personalities with people who enjoy their work and the people around them. People need to have pride in what they do and gathering likeminded people produces the best results. ACBB: You’ve recently released a special 15th Anniversary HOPS, Mango & Ginger beer and are planning on releasing a second anniversary brew in the fall. Can you share any specifics? Editor’s Note: Daniel joined us for part of the conversation to discuss the first 15 th anniversary beer. He described it as a beer with more of a tropical side balanced with 15 different types of hops used in the brew. It is very floral, piney with a taste of ginger that matches well with the number of hops used in its production. My thoughts on the beer? Beer geeks shouldn’t be scared off by the mention of mango and ginger in the title, this is an excellent beer with lots of character and not overly fruity or overwhelming ginger taste to it (9.0% and 100+IBU’s!). BT: Regarding the second of the special edition beers, I can’t speak to the specifics as of yet but can let you know we expect to release it in late Fall and that it will be darker with a couple special twists. ACBB: Why did you decide to create the Ultimate Brew Off competition and has this year’s style been decided? BT: We started the home brewing competition 4 years ago as a way to connect with the local enthusiast. It’s grown quite a bit over the years, this past year we had 62 entries which makes it a challenge to give each sample the time they deserve. We may have to restrict the number of entries this year as a result. We strive to pick a style that is both interesting but makes sense for those without elaborate setups. We do blind tasting initially to weed the number of entries down and bring in BJCP judges for the final decision. There were several great entries this year including a Rye IPA with ginger that stood out in addition to the winners. This year’s winner was female (Kellye Robertson) which was also a first. We haven’t picked this year’s style as of yet but are planning on reaching out to people who have submitted previously for recommendations. ACBB: Your Spruce Beer generated a great deal of buzz when it was available last Winter, can you tell me about the beer? BT: This is a beer that was initially a curiosity to us and we appreciated the historical references to the founding of Halifax as it was brewed in the area at that time. We even came across some “how to brew spruce beer and cook beaver” reference material when researching the beer. It described cooked beaver as fatty, chewy and basically edible at best. The Spruce beer didn’t sound much more appealing based on the description! Daniel was really pushing to brew this, he really wanted the challenge of creating something very unique and I kept asking him “how am I going to market and sell Spruce beer”? This has really turned into a big success for us, we brewed three times as much Spruce beer last year as the first year although the harvesting is a lot of effort. Overall Spruce Beers are growing in popularity with some form of Spruce beer available in many provinces at some point in the year. ACBB: If you weren’t the president of Garrison Brewing Company today what would you be doing? BT: I’m not sure if I’d be in the Navy. I enjoyed it, especially all of the travel when I was younger. I would want to do something that offered up a lot of travel. I always enjoy going to the Craft Beer Conference every year and several beer festivals. ACBB: You organize the Halifax Seaport BeerFest. Can you share some details on this year’s event? BT: This is something I run with a friend, Bruce Mansour, and is completely separate from the brewery. We expect to have over 200 beers available to sample this year with the Quebec pavilion fielding nearly 40 craft brews and Ontario over 30. We’re also expecting more gluten free options and cider this year. We’ve even added a second Halifax brewpub, Rogues Roost, sampling beside Rockbottom and south shore nano, Hell Bay. We’re pretty much at capacity for this event with 4500 expected over the two days. The big thing is we don’t want people waiting in long lines so we keep adding more & more beers every year. I think we’re at about 96% craft/premium import & may push for 100% next year. Sorry, no Bud Lite Lime this year! 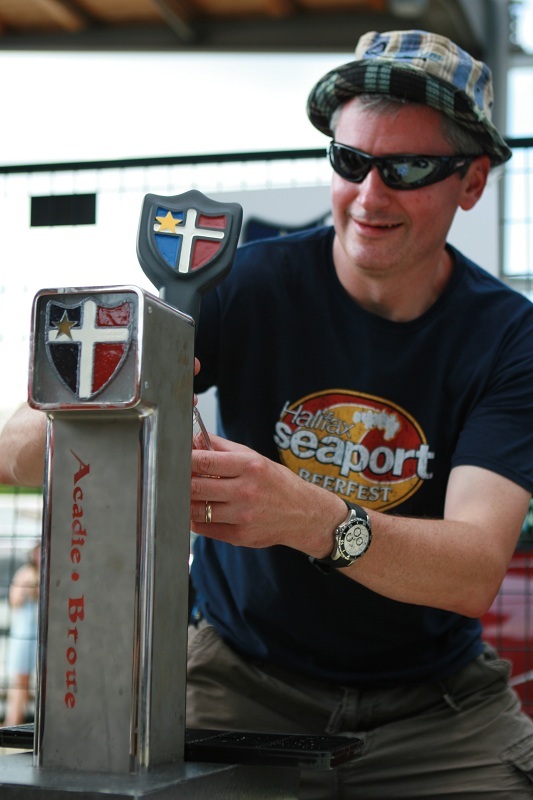 Now that the Canadian Brewing Awards are traveling to different locations we’re hoping to bring it to Halifax for 2014 (it sounds like it will be in B.C. next year). People are starting to notice the great beer here on the East Coast and this would only help with visibility. We would definitely work to make the awards in Halifax the most memorable ever! ACBB: Any new beers and / or collaborations being planned for the near future? BT: We have our regular seasonal beers coming up in the Fall but no new ones planned other than the second 15th anniversary special edition brew. We’ve had five other breweries express an interest in doing collaboration beers with us but we haven’t been able to squeeze it into the schedule yet. In addition to the one that Matt Philips did with Daniel for the fundraiser, Daniel also returned the favour by going out to B.C. and developed a Baltic Porter with him for their market. There was nothing like it available there at the time & it went well. I don’t think the big guys see how much some of the small breweries work together. ACBB: Do you have any future expansion plans? BT: We’re currently brewing 3 times per day 4 days a week between 5am and 2am. We’re at the limits of this space and have no warehouse capability. We have an option at the port and lots of other options around as well but haven’t finalized anything yet. We’re getting pushed to the next level rather than overreaching. ACBB: What does the next 15 years hold for Garrison Brewing Company? BT: I expect we’ll be having even more fun as it feels like things are just getting started. I expect I’ll do another 10 years personally then just travel & drink! Now that we’re out of survival mode (in the early days it’s a race to get to the level of volume to overcome your overheads) and have a level of security, it’s all about having fun. We want to have some growth but you’ll never see us offer up generic beers. We need to continue to focus on consistency batch after batch, while still bringing out interesting releases. We also plan to continue to be active in the community. We’ve sponsored the Jazzfest for 13 years and Multicultural Fest for 6, plus countless charity events and team sponsorships. For additional information on Garrison Brewing Co., you can check out the profile I did of the brewery last February or this video interview from True Canadian Beers website. ← The Story of Propeller Brewing Company – Halifax, N.S. IMO, Garrison is by far the finest craft brewer in Atlantic Canada.